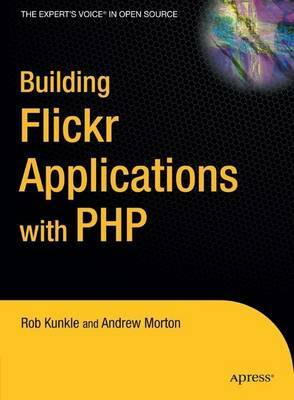 Building Flickr Applications with PHP teaches you how to use today's most popular online photo management system. You'll learn to work with both your own photos and Flickr's enormous cache, and create new and compelling extensions to the Flickr platform. This book is a great pick because It's written by experienced developer Rob Kunkle and Phlickr developer Andrew Morton. You'll learn how to use the PHP API Phlickr to write and retrieve photos. Flicker is growing quickly in popularity in the online photo management world. Using the popular PHP-driven Phlickr API in conjunction with MySQL, you'll discover how to take advantage of open source tools like PHP, Apache, and MySQL, as well as the Flickr architecture, to manage, retrieve, and format photos in imaginative ways. You'll also learn how to build upon Flickr's photo collaboration features to create interfaces for working with others on photo album projects. And you'll learn how to format Flickr tags--taking advantage of RSS to distribute photo updates. Andrew Morton is a developer for Cypress Systems, Inc. and creator of the PHP-driven Phlickr application programming interface.